I think your wondering what BOOMM means. Well I got it off The Erin Simpson Show but pimped it up a bit. 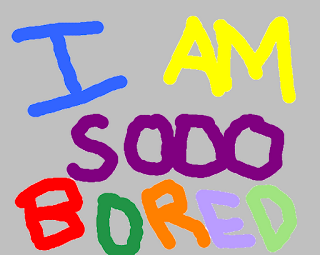 It means bored out of my mind!!!! And that is extremely how I feel right now. Nothing has popped up yet except for that show How To Train Your Dragon at Vector Arena. But apparently I am not going but my cousin Toafa and my brother James are with my mum. I am SSSOOOOOO BORED!!!! I need something to do. And FAST!!! Makerita do you know about the workshops that Ms Muliaumasealii is running at school? On again tomorrow - 10am and Friday. I know that you will need a signed permission form however to attend.